The BYD e6 reaches speeds of over 140 km/hr (~87 mph) with a range of 300 km (187 miles), making it ideally suited for the demands of police utility vehicles. The virtually silent engine of the BYD e6 is beneficial to police as they perform daily patrols and law enforcement activities in Shenzhen, and with no direct emissions, the e6 reduces total CO2 emissions, improving the city environment. 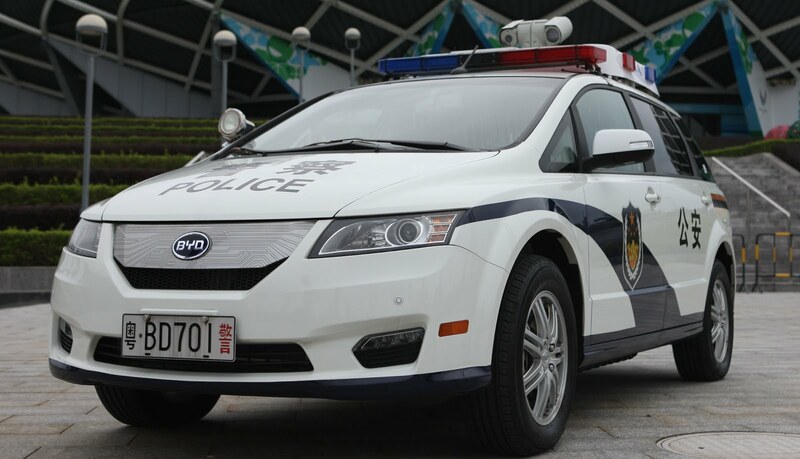 In addition to police vehicles, BYD has deployed over 300 all-electric, e6 taxis which have been in service in Shenzhen for the last several years, with an accumulated mileage of over 38.5 million kilometers (or 24M miles as of Dec. 30th, 2012). Individual BYD e6 mileages have reached 250,000 km (or 156K miles), equivalent to over ten years’ service life in a standard consumer car. The city of Shenzhen also operates 200 BYD pure-electric 12m (40 foot) rapid transit buses which have an accumulated mileage of over 12.8 million kilometers (or 7.9M miles). Shenzhen city is currently planning to add 500 additional BYD e6 pure-electric taxis and over 500 additional BYD electric buses to the public transport system.